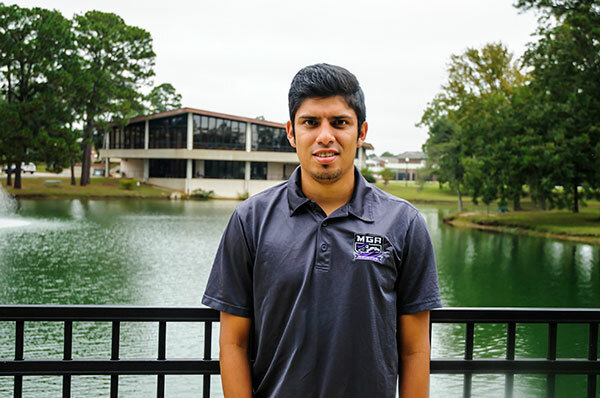 Student-athlete Carlos Sandoval-Blanco is a standout on and off the field. Full Name: Carlos Arturo Sandoval Blanco. High School: "FESA. During high school, I played soccer for FESA, which is a high performance soccer academy." Family: Mother, Jesús de Sandoval; father, Armando Sandoval. Employment: Full-time student and student athlete. Degree Objective: Bachelor of Science in Business and IT with a major in Production/Operations Management. Activities: Men's Soccer, President's Torch Society, MGA Honors Program and National Society of Leadership and Success (NSLS). or the US. The reason why is because I like being in positions where I have a lot of responsibility and make important decisions." He chose Middle Georgia State because ... "I was interested in being part of its soccer program and also because I wanted to be part of the school's transition to university status." The one thing that surprised him about Middle Georgia State was ... "How nice are people in this area." His favorite place to study is ... "My dorm because it's quiet and nobody can interrupt me when I need to be focused." His friends make fun of him because ... "Sometimes my friends in the U.S. make fun of me because of different customs I have since I am an international student." Five years from now he sees himself ... "Enjoying my current goals in life and pursuing some new ones."